U.S. President Donald Trump reacted strongly to the new postponement, until October, in the trial of Pastor Andrew Brunson, who remains jailed in Turkey. “A total disgrace that Turkey will not release a respected U.S. Pastor, Andrew Brunson, from prison”, President Trump wrote Wednesday night in his personal Twitter, notifying the message to President Erdogan. Just hours earlier, at the State Department’s regular briefing, correspondents were asking questions, whether the United States has softened its stance towards Turkey, while Brunson’s lawyers were revealing intense diplomatic movement to succeed the pastor’s release,. Nauert said that the case against Pastor Brunson is built on anonymous sources, unsubstantiated accusations, and a lot of speculation and that concerns U.S. government. 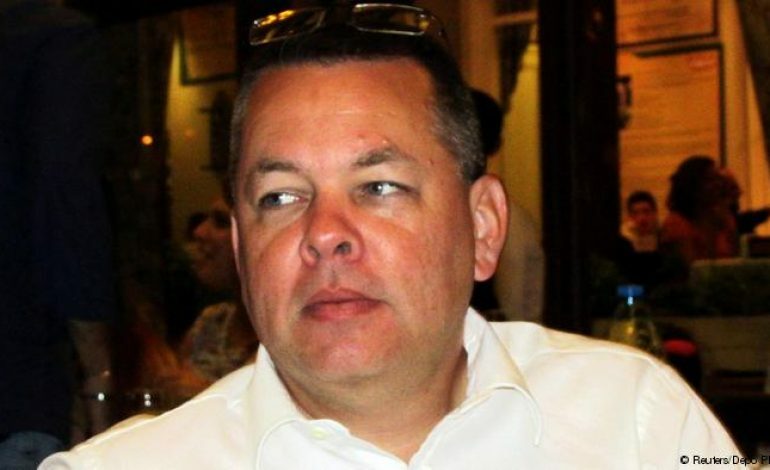 The latest rumblings about the Brunson case indicate intense behind the scenes diplomatic movement for the release of the Pastor. The U.S. Congress has increased its pressure on Turkey and various pieces of legislation have been introduced in both chambers connecting Brunson’s release along with the cancellation of the S-400 deal to the transfer of the F-35’s. Brunson’s lawyer Jay Sekulow – who is also President Trump’s personal attorney – released a podcast on Wednesday with his son Jordan Sekulow of the American Center for Law and Justice, on which he talked about intense diplomatic activity that is taking place in order to secure the release of the American pastor. According to Jay Sekolow, multiple signals have been received by both the U.S. and the Turkish government regarding some imminent action. “Since this morning we are in contact with the offices of President, the Vice President and the Secretary of State. The full resources of the United States are engaged right now”, said Jordan Sekulow, predicting developments in the next 24-48 hours. “If we get a deportation it’s a victory”, Jordan Sekulow added. Turkish press reported a telephone call between Presidents Erdogan and Trump on Monday and another between Foreign Minister Cavusoglu and Secretary of State Pompeo on Wednesday. There were no readouts for either conversation from the Trump Administration. Sources in Washington were insisting that negotiations are taking place for a deal to allow the release of Pastor Brunson. The US offers in exchange the convicted Turkish banker Hakan Attila, but to this point all indications are that Ankara is holding out for an exchange of Brunson with Fethullah Gülen. Legal sources say it is impossible for the U.S. government to decide to extradite Gulen to Turkey, since it’s up to the U.S. Courts to make such a decision. Given this is not an option, Turkey may try to get “more lenient treatment” on the S-400 and F-35 issues. Last week the Trump Administration opposed the restrictions proposed by U.S. Senate against Turkey, in a letter from Mick Mulvaney, Director of the Office of the Management and the Budget, to Senator Richard Shelby, the Chairman of the Committee on Appropriations. “Turkey is an important NATO ally, and has been an international participant with the F-35 program since 2002. The Administration shares the Congress’s concerns over recent Turkish actions but opposes language that preemptively restricts its ability to work with Turkey to address those concerns,” the letter stated. President Trump’s strong reaction on the Twitter may be an indication that U.S. proposal for a deal on Brunson’s release has not been accepted by the Turkish government.